Almost a year ago, I heard about a new cafe opening on Passyunk Avenue. Since we live just a few blocks from “the Avenue,” we’re always excited to hear about a new shop, bar or restaurant. [Side note: some of my favorite spots are Green Aisle Grocery, Fond, Salt & Pepper, Izumi and Nice Things Handmade, although I could spend–and have!–hours strolling with my dog, husband and a La Colombe cafe au lait from Capogiro and chatting with locals and shop owners alike.] In October, The Food Trust hosted the first ever Night Market on the Avenue and we (along with hundreds of others) checked out local food merchants, including Chhaya, a new cafe that served a variety of food on waffles. My friend, Farish, and I got something that was either chicken or chick pea curry on a waffle (I’m still not sure why we couldn’t figure it out–I think the guy said one thing but it tasted like the other.) We enjoyed the little taste and made a note to check it out. Fast forward to last weekend. My husband and I slept in and were ready for a hearty Sunday brunch. He wanted pho but was overruled–I wanted a place where I could relax with a leisurely cup of coffee and Nam Phuong isn’t quite that place (don’t worry, he got what he wanted later in the day!) I had been eyeing up Chhaya’s reviews on Yelp for the past week or so and figured it would be a great time to check it out. We headed over there with empty bellies and high hopes. Chhaya is adorable. I walked in and noted immediately that it had more of a coffee shop vibe than cafe. We were greeted immediately by the friendly waiter (who also served us during the Night Market) and gave our drink orders. 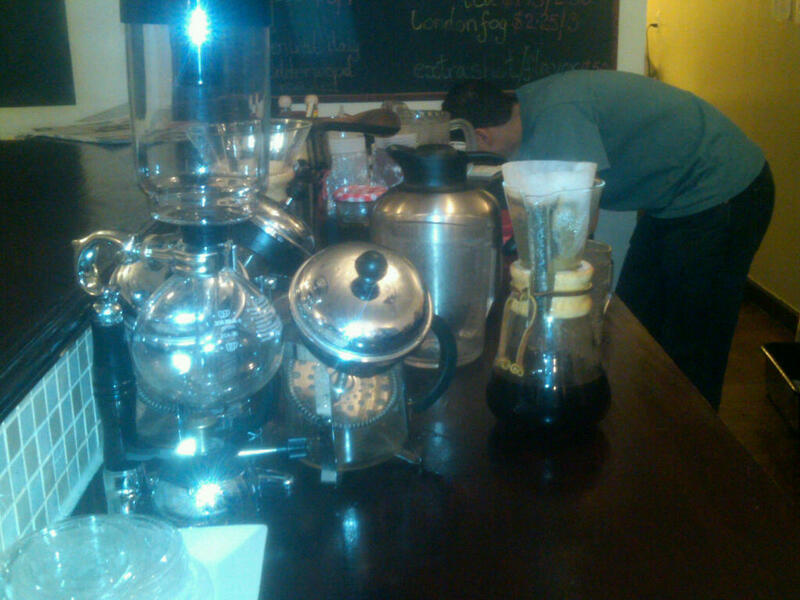 Chhaya has four different types of coffee that can be served three ways–siphon, pour over or french press. This is my kind of place! I’ve recently become obsessed with “pour over” or Chemex style of coffee thanks to Bodhi Coffee (love that place!) 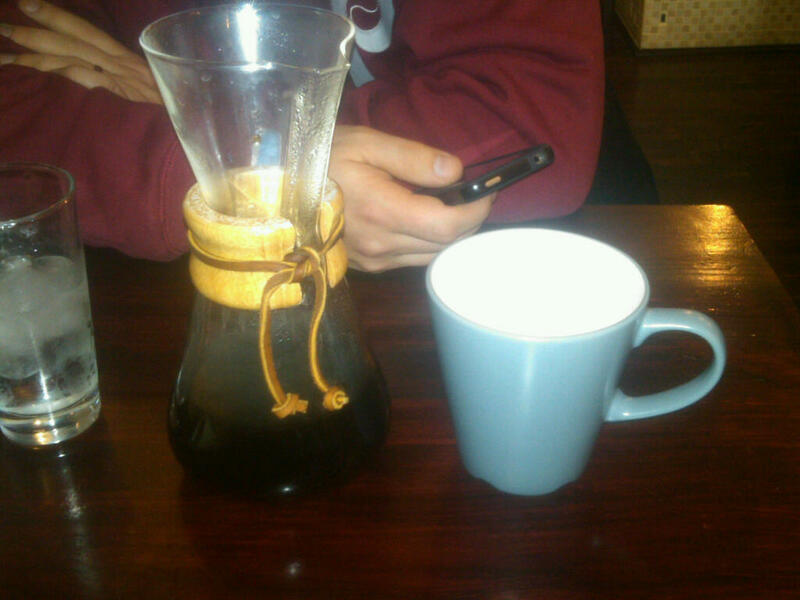 Chemex is an hourglass-shaped glass vessel in which you pour hot water over a special filter. It’s very streamlined and simple and I am absolutely in love (hint, hint, my birthday is coming up!) I went with the Honduras coffee and was very ok with the forewarning that the pour over style would take some time. As the gentleman behind the counter prepared my drink, I walked over to get a photo. He was a bit perplexed and had some difficulty understanding what I wanted but this was my drink in progress. When it finally came to the table, I had about a cup and a half of coffee. It was a pretty light roast and notably SMOOTH. We perused the brief but comprehensive menu and I went with one of the waffle specials–their version of Huevos rancheros with black beans, tomato salsa, avocado and chorizo topped with a fried egg and hollandaise. I remarked that the Hollandaise was an interesting addition and the server explained that some folks had complained that the dish was too dry so they figured they’d add a little sauce. Hollandaise makes everything better, right? My husband went with the bagel sandwich with cream cheese, bacon, avocado and tomato with an optional egg. He added the egg but never received it. Oh well. The sandwich was good but pretty straightforward. It’s a little harder to tell in this picture but the waffles are all served on plates that are just a bit larger than the waffles themselves. This caused quite a dilemma for me. Because the dish was slightly deconstructed–the beans, tomato, chorizo were all in separate areas rather than mixed together–I had a hell of a time trying to get a good bite. Besides, every time I tried to cut into the waffle, the whole thing would slide around a bit and, inevitably, something would fall onto the table. It was a messy meal. I need a little space, folks! Taste-wise, the waffle was still pretty dry, even with the addition of Hollandaise that is evident in the picture but I barely tasted it. Each of the flavors was good on its own, but the plating made it impossible to mix them. Final verdict–great concept, implementation needs work. Give me a bigger plate and double the toppings so that each bite is not overwhelmed with dry waffle and we can talk. I will definitely return to Chhaya for a cup of coffee and perhaps a smaller bite, but I’m not sure about this whole waffle thing anymore. This sounds like a restaurant that Dad would open up, just trying ad hoc combos and making on the fly bagels with whatever in it. Can I start off with, beans on a waffle? Why? You’re extremely risky which is something I’d like to do while I’m tasting food but I’m afraid to experience something like you did here. 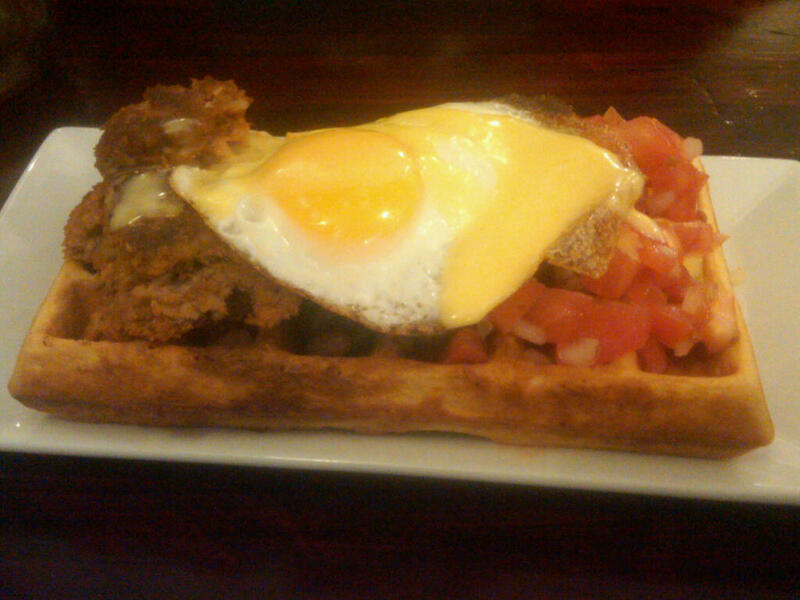 But I must say although you said the waffle was dry it looked so good even with the egg on top and I hate eggs! 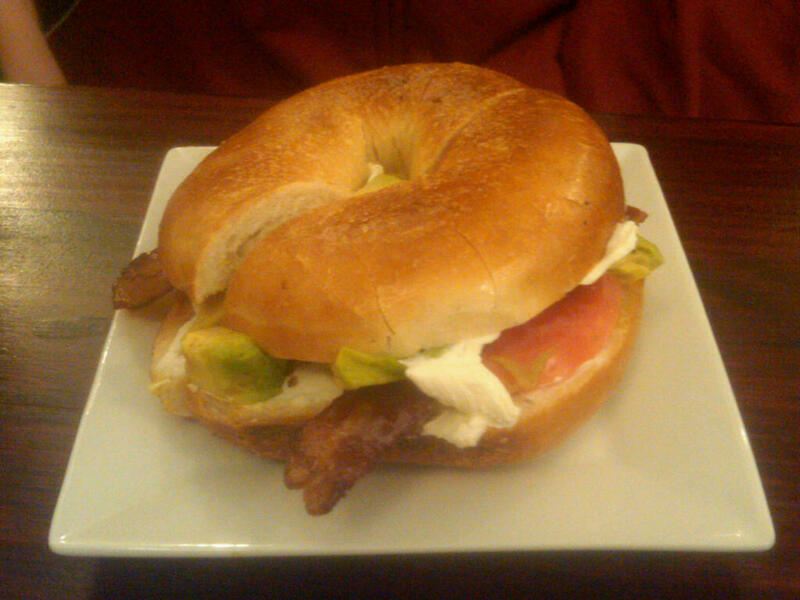 Bagels have to be one of my favorite breakfast items and with the cream cheese, bacon, avocado and tomato it sounded and looked better than any bagel I have ever eaten! This is a bagel I would dig into which is odd because I also hate tomato. Although you say the food wasn’t as great as you would have liked it to be I think on the plus side the presentation was amazing.